Fulham's midfielder tells the Observers Bill Bradshaw why he could not face playing against his beloved Newcastle United for Sunderland. Fulham are leading the Nationwide League's charge on the Worthington Cup, but influential midfielder Lee Clark is uncompromising in his assessment of how important the competition is to the First Division leaders. With seven of the last 16 coming from outside the Premiership - six from the First Division - the scent of a major final willgrow stronger for those who prevail in this week's fourth round. But, with his side about to face struggling Derby County, Clark's focus remains fixed on the league. 'Promotion is what this season is all about,' he said. 'Give everyone at Fulham the choice between three points at Preston next weekend or making progress against Derby and we'll take the three points. If all the above sounds like stock diplomacy from a disciplined, focused professional, it's perhaps understandable. Clark has sailed close to controversy in the past and while he has the air of a young, carefree player, it's a good mask. At 28 he finds himself locked once again into a promotion campaign, having helped Newcastle reach the fledgling Premiership in 1993 and prompted and probed in Sunderland's midfield as they won the league by a record margin in 1999. On the day he left Newcastle for Wearside in 1997 he was named in an England squad by Glenn Hoddle. He is a player of genuine class and Premiership quality yet here he is again, scrapping to join the elite. His last move two summers ago was coloured with controversy. 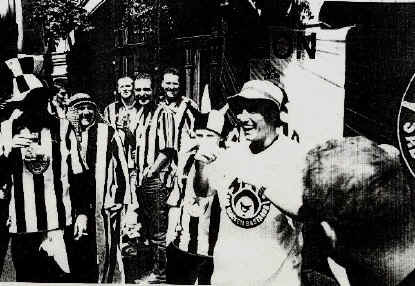 Having enjoyed the celebrations following Sunderland's promotion he found himself in the middle of a furore after the revelation that he had joined Newcastle-supporting pals at the FA Cup final against Manchester United ... wearing a T-shirt mocking the Wearside fans he then played for: 'Sad Mackem Bastards' screamed the logo and Clark, a lifelong Gallowgate fan, had to go. His account of that departure from the North-East is compellingly honest. 'The T-shirt incident is a massive regret in my career,' he says. 'But although we'd won promotion, I had already told Peter Reid, the manager, that I was thinking of moving. In hindsight, joining Sunderland was a mistake. 'A mistake because of my background. Everyone knows I'm Newcastle through and through. When I left Newcastle, the prospect of staying in the North-East, close to my family, was the big pull in going to Sunderland. But when we won promotion it dawned on me what that really meant. I would have to go to Newcastle the following season as a Sunderland player. Clark tempers this confession by accentuating the upside of his two years on Wearside. He was accepted by the fans: 'They knew where my heart lay but were happy so long as I did the business for Sunderland on the pitch. And they knew I did that - always. Although there were other options, almost certainly including Premiership clubs, Clark went to Fulham to be reunited with Paul Bracewell, his old team-mate at Newcastle. When Bracewell was sacked last season it left Clark a little bewildered in the big city at a club now stripped of the North-East influence that had formed part of the attraction when he joined. And stick he did, finding a the new manager with even better international midfield credentials than Bracewell - Jean Tigana. So far, the move has been wonderful for Tigana, Fulham and also Clark. A blip following an unbeaten start to the campaign followed defeat in October at home to Preston but that is now forgotten. Fulham went into the weekend five points clear and the talk is often not if Fulham go up - but when. Clark, a veteran of those successful Tyne-Wear campaigns in the Nineties, is perfectly placed to assess their chances and their capability. 'I'd say right away that we're not taking anything for granted. I know only too well that it can go wrong if you take your eyes off the target. If Fulham make the top flight for the first time since the Sixties, what will Clark's advice to his colleagues be, especially those without Premiership experience? His answer is swift and characteristically frank: 'Keep the ball for as long as possible, as long as you can,' he says. Last weekend, as he was scoring and helping Fulham to a convincing win against Portsmouth, his old clubs were meeting on Tyneside, where Sunderland won 2-1 before more than 52,000 fans. 'I was so pleased to beat Pompey and then I was instantly gutted when I heard the derby score,' Clark admitted. But now he has the prospect - without counting chickens - of facing both clubs if Fulham go up. 'If we do, I'd love to go back to St James' because I haven't played there since I left. As for the Stadium of Light...' he smiles awkwardly to himself... 'that will be a bit hot, won't it?